Oh, I know it looks all innocent over there, wide-eyed and pink and oh-so-sweet but don't you believe it for a moment. That cardi is the devil's workshop. The pattern was beautifully simple, clear, well-written, error-free. You couldn't ask for more. So why oh why did I struggle so much with the #*@*! @( thing? I'll tell you why: the yarn. Plymouth Baby Boutique (also spelled Boutic on some ball bands) (See what I mean? 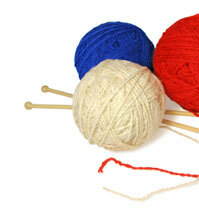 If the yarn doesn't know its own name how can you trust it?) made me totally crazy. I swear it has a life of its own. 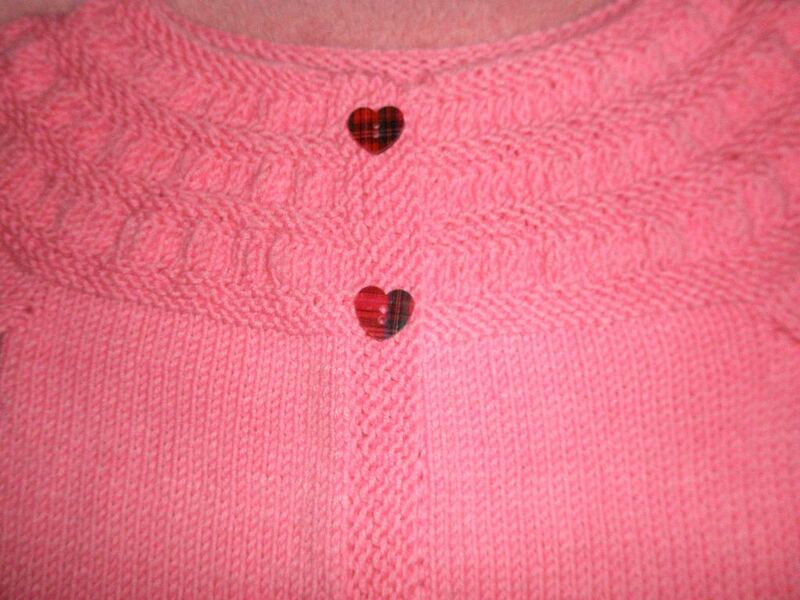 It's not meant to be a stretchy yarn but some end-of-row stitches stretched out to three and four times their length. And let me tell you, that's one scary sight when you have almost 300 stitches on your needles and no desire to tink, frog, or jump off a high building. It's a mystery, that's what it is. A knitting mystery. Stretchy yarn shouldn't stretch like that. And it shouldn't spring back into position as if it never happened. Shouldn't there be a calling card left behind? Some little hint that the knitter at the helm isn't crazy? That the whole now-you-see-it-now-you-don't thing wasn't a figment of her imagination? 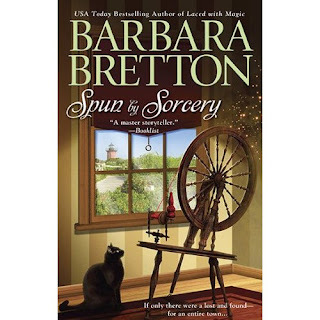 SPUN BY SORCERY is set for release in November and my anxiety attacks are gearing up in preparation. I'm hard a work on Sugar Maple #4 and struggling to come up with a title that combines magic and knitting. And that's a whole lot harder than it sounds. Because I've missed you (and have an inherently evil streak) drop me a note here with Baby in the subject header and you'll have a chance to win some of that possessed Baby Boutique yarn. But don't say I didn't warn you. 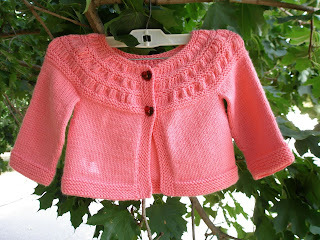 The yarn for the Tiny Tea Cardi sounds really possessed and a BABBY is that way at times also. I've been reading and knitting. Enjoyed SHORE LIGHTS this summer. I don't normally read fiction based around knitting (or really any non-technique/pattern knitting anything) but I loved your two books and can't wait for the third. Come to think of it I almost never read anything that could fall into romance cateogry either... Anywho, I also hope there's many more after that. Thesaurus time? I can't wait for Spun by Sorcery. Your Sugar Maple series is so entertaining and relaxing to read! I am so excited for this book. I loved the first one and then found out it was a series I about died. Even though I don't knit I love these books and so happy to hear book 3 is coming soon. I just added it to my Amazon wish list. I'll have to send you an email but I would love it if you could drop by Fang-tastic Books to promote Spun by Sorcery.